The Palace could seat up to 650 and in the days before television was a great success. Even in the 1950s I can remember the house being packed for Rock Around the Clock with Bill Haley and the Comets, but shortly after that, as television became more popular and affordable, audiences fell sharply and the cinema closed on January 22nd 1961 – a fifty year life. The photo above can be dated to 1928, because the two featured films, Palais de Danse and Tommy Atkins both came out in that year. 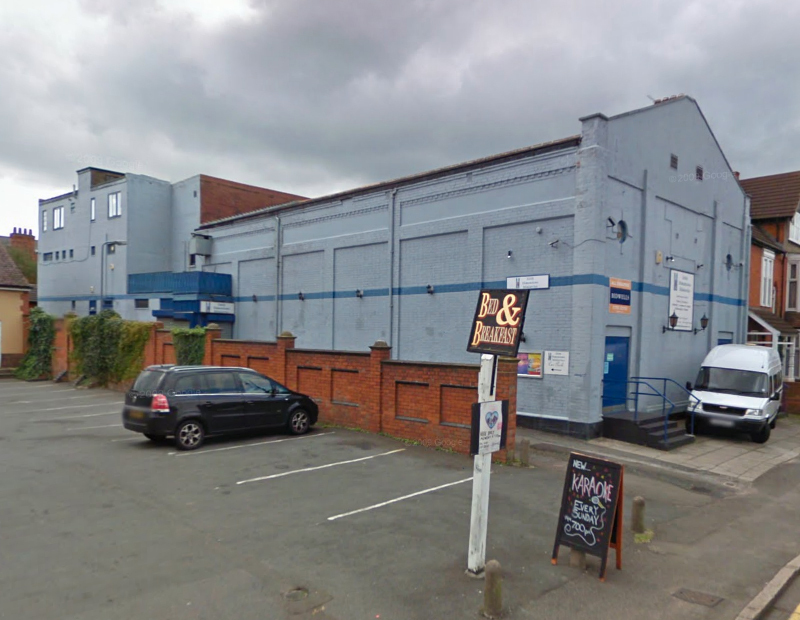 Since that time it has been a bingo hall, a dance hall, a night club and a church. 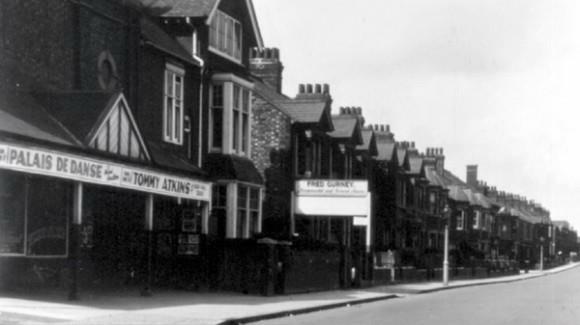 The front canopy over the forecourt area, which was very useful when waiting for buses has long since disappeared. Today the building looks like this. Jobs change over time. Today the British Transport Police hold a vital role in seeing to the safety and security of passengers and goods and are active in the prevention and solution of crime, which is what we would expect in a modern service. 175 years ago it was very different, although, as I will try to show in this post, the seeds of today’s transport police were there from the outset. It was plain to most in the 1830s that these new locomotives, capable of unheard of speeds as much as 30 miles per hour, were potentially dangerous machines. Everyone already knew about the famous accident at the Rainhill trials in 1829 where the MP William Huskisson was killed by carelessly stepping in front of Stephenson’s Rocket. There was a duty then for the directors to try to ensure that the travelling public were kept clear of the trains and that the line itself was kept clear of animals, people and obstacles. The railway policeman was invented. I don’t think many qualifications were required of these early policemen: they would have (as were all railway employees) to be literate and they would have to be of good character. In the case of policemen a height qualification may have been added, but I cannot be specific. These men were also given signalling duties, which at first was a system of flags or lamps at night time. Mechanical signals developed over the next decade and later the centralised signal box and the specialist trade of signalman, but in the early years this task was entirely in the hands of the policemen. 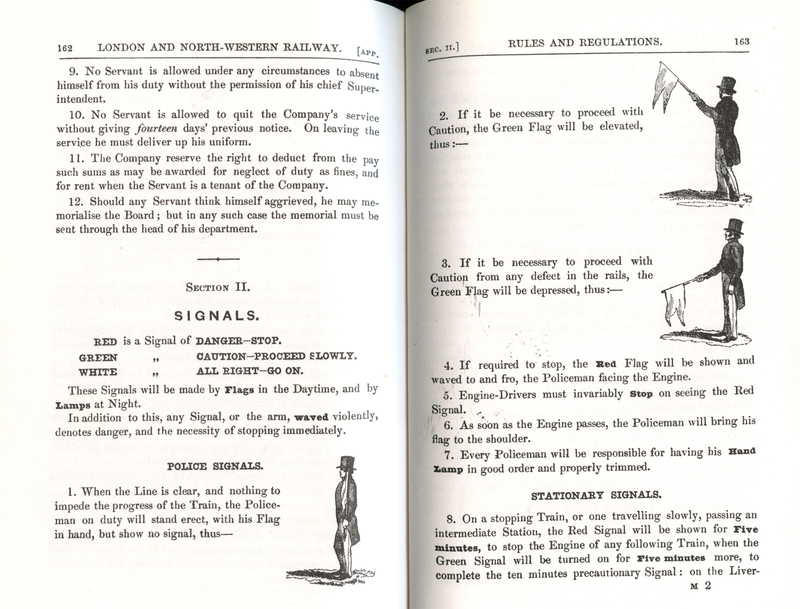 As you can see from this LNWR Rulebook from the late 1840s the business of signalling was fairly primitive. Policemen were ranked. At the head was a Superintendent, below him Inspectors and the rank and file were Constables. I haven’t discovered a Sergeant in the early records, and this role in larger stations like Euston was given to a man called the Foreman. As it happened, the Superintendent, a man called John Bedford, was based at Wolverton for the first 20 years. He administered the Police Department for the entire line and probably had to travel frequently to all points between London and Birmingham. When the villas were built in Wolverton in 1845 he moved into one of them, as befitted a man of his status. 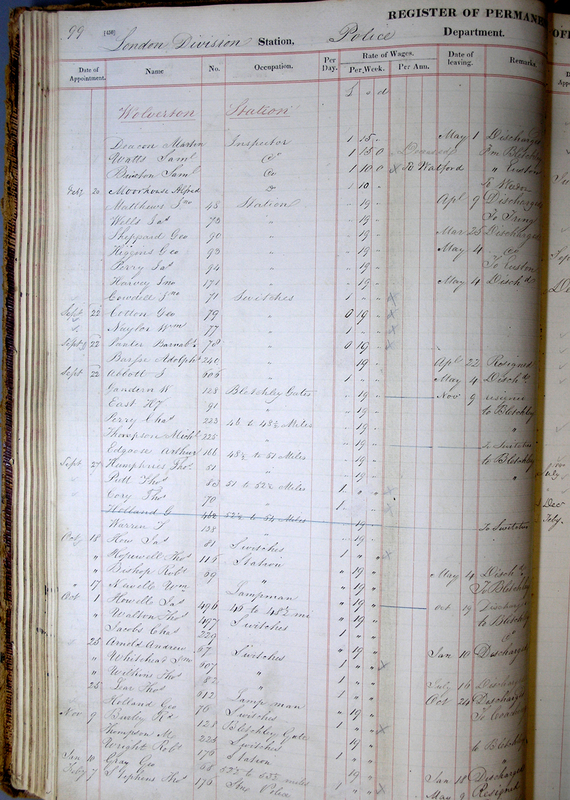 If we take a look at the LNWR Salary Register from the late 1840s we can get some idea of the range of duties of the early railway policemen. The inspector, Samuel Watts, was in charge at a weekly wage of £1 15s. There were several men under his jurisdiction, although it is hard to be precise because there was considerable movement amongst policemen, either to another posting, or in some cases, discharged, suggesting that the job was demanding and that any dereliction of duty was dealt with summarily. At any rate there is a least one man at the Station, a man for the switches (points as they were later known), and several men who each covered a 2 1/2 mile section of the line. W. Gandern at “Bletchley Gates”, Charles Perry from mile 46 to mile 48 1/2, Arthur Edgoose from mile 48 1/2 to mile 51, Thomas Putt from mile 51 to mile 52 1/2, T. Warren from mile 52 1/2 to mile 54. There is also a “Lampman”. On this basis we can construct a picture of two men at the station, one with general duties at the station who probably signalled train arrivals and departures. Another man with the job of switching the points at either end of the station and in addition taking care of the safe movement of engines from the engine shed on to the line. The remainder were out on the track, each covering a 2 1/2 mile section, and I presume holding responsibility for keeping the line clear, reporting any damage and giving signal warnings to trains. 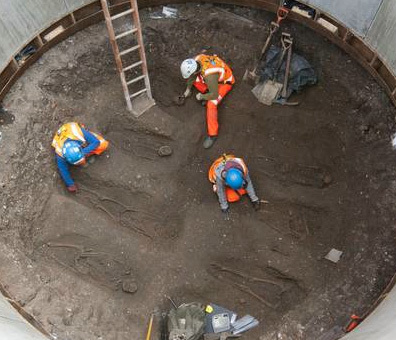 They all put in long hours and worked seven days a week. For this they were paid 19 shillings or £1 a week. To put that figure in perspective, Porters were paid 16s to 19s per week, Ticket clerks from 25s to 30s a week, and Engine Fitters in the works were paid 25s to 30s per week. Engine Drivers were paid by the day at a rate of 7s 8d., which meant that they could in theory earn over £2 a week. What I take from this is that the job of a railway policeman was not in those early days seen as one which required special skills or training and therefore did not command an income higher than the average railway worker. It was, however, considerably better than the income of an agricultural labourer of the day who would be fortunate to take home 8 shillings a week.What seems to be a high turnover at Wolverton would suggest that it was a hard job.